Both ran several times during this afternoon's Ohio State-Ohio University football game. They're both mute-the-sound moments. The first is absurdly juvenile. Both make zero sense. Think about this when you go back to work: People actually get paid for to write this stuff. And supposedly intelligent people, including Bill Gates and Jerry Seinfeld, appear in them. This editorial cartoon from The Columbus Dispatch puts things in perspective, the woman in it asking the question that all Ohio State football fans have been wondering about all week long: Will Beanie Wells be able to play in tomorrow's game? The answer is, "No." But hopefully, he'll be ready for next week's showdown with USC. First, it should be said that people who entrust their lives to Jesus Christ can face death and what lies beyond with confidence. From Jesus Himself, we have the assurance that all who believe in Him won’t forever be erased or go to hell, but live with God forever, something He tells us in the Bible’s most famous passage, John 3:16. Jesus-Followers know that whatever lies ahead, they belong to Jesus Christ. period. But the Bible seems to say two different things about what happens to followers of Christ when they die. There are numerous passages that intimate believers fall asleep, awaiting what the Bible calls “the day of the Lord,” when Jesus returns and brings them back to life again. On the other hand, there are passages of the Bible which intimate that the Christian’s transfer to heaven follows death immediately. So, what are we to make of these seemingly conflicting teachings? An important principle to apply in understanding the Bible is this: When confronted with such apparent conflicts, we should avoid the easy-outs of harmonizing or of choosing one teaching over another. Christians believe that the entire Bible was inspired by God. [Second Timothy 3:16] Nothing is there accidentally. Beyond that, particularly as it relates to the New Testament’s witness for Jesus, the Bible is a far more historically-reliable document, written closer to the events it describes, than almost any other historical writings we have from the ancient world. The whole Bible deserves a fair hearing from fair-minded people. So, I would say that these seemingly conflicting perspectives on what happens to the Christian who dies are both true. I believe that these two teachings--death as sleep, on the one hand, and immediate transfer to eternity with the God we know in Christ, on the other--are really two perspectives of the same experience, two sides of a single coin. From the earthly perspective, the believer has fallen asleep. They’ll remain that way, dead, as Jesus’ dead body remained from Good Friday through the first Easter Sunday morning, until Jesus returns and rouses them to life again. But from the perspective of eternity, which is a state of timelessness, what C.S. Lewis called “the eternal now,” believers who have died already are in heaven, already in God’s presence. Earlier today, at our church I had a discussion with our congregational Women of the Evangelical Lutheran Church in America, on the question of why God allows human suffering. I drew in part on a four-part series I wrote four years ago called, When Tragedy Hits the Innocent. Below are links to all four installments. I hope that you find them helpful. LDR [Lutheran Disaster Relief] Ohio is coordinating resources to assist over 2 million people who were evacuated when Hurricane Gustav struck the Gulf Shore states on September 1, 2008. Funds are needed to transport the Disaster Response Shower Trailer to the Gulfport, Mississippi area. Additionally, donations of building supplies, furniture, and appliances are being accepted to fill the Disaster Response semi-truck. Funds are needed to cover transportation costs. In the coming weeks, volunteers will be needed to start home repairs and rebuilds. Information for volunteer reception centers will be made available as the centers are established. Monetary donations will be used to assist families with special needs that are not addressed by government services. To donate items for the semi-truck and for other information, please contact Mary Woodward, LDR Ohio Disaster Coordinator, at 740-732-6700. To make monetary donations, please forward donations to LDR Ohio, 810 Main St., Caldwell, Ohio 43724 or to donate online go to the Lutheran Disaster Response Hurricane Response website. Were Huckabee's Veep Chances Hurt by His Being a Pastor? With the mounting complications over John McCain's pick of Sarah Palin as his running mate, some conservatives have been asking why the expected Republican nominee didn't choose former Arkansas Gov. Mike Huckabee, who won eight GOP primary and caucus contests and appeals to the same Christian social conservatives who have hailed the Palin pick. After all, Huckabee has more executive experience, was vetted by the media during the primary season, and honed his debating skills in myriad televised matchups. The answer, according to Richard Land who heads the Southern Baptist Convention's Ethics and Religious Liberty Commission, is pretty simple. Huckabee is an ordained Baptist minister and, Land says, "polls show that 15 to 20 percent" of the electorate don't think a minister should be president. There's that, and the fact that economic conservatives are not fans of Huckabee, says Jim Wallis of Sojourners. So Huckabee, in the end, had a trifecta working against him: his ordination, his support of a scheme to replace federal income taxes with a national retail tax, and, ultimately, his gender. Huckabee's economics may have hurt him. His gender, in an election year when it was only sensible for McCain to ask a woman to join him on the ticket, may have also hurt Huckabee. His ordination probably did hurt Huckabee, especially because he's a Republican. A person with Huckabee's background and credentials would far likelier win a place on a Democratic national ticket than on a Republican one. Had the Ohio governor not withdrawn his name from consideration the vice presidency, I believe that the campaign of Senator Barack Obama would have taken a hard look at Ted Strickland as a running mate. Strickland is an ordained Methodist pastor. In the end, Strickland's lack of high profile experience in foreign policy, something that Obama desperately needed to shore up his own total inexperience in this area, probably would have kept the governor from being on the ticket. But I believe that his status as a clergy member, not to mention being from Ohio, enhanced his attractiveness for Obama's handlers, fueling speculation about him as a Veep choice long after he had emphatically taken his name out of consideration. For Republicans, of course, the calculus for constructing a national ticket must necessarily differ from that of the Democrats. The GOP has become so associated with the conservative evangelical wing of Protestantism that bringing the evangelical Protestant preacher Huckabee onto the ticket would only have confirmed the negative view of such an association on the parts of independent and Democratic voters John McCain will need in order to stand up to Hurricane Obama. Had former New York City Mayor Rudy Giuliani been nominated by the Republicans, he would have likely jumped at having someone like Huckabee on his ticket. As it is, of course, McCain has selected someone that conservative evangelicals seem to like in Alaska Governor Sarah Palin. But she brings other attributes to the ticket as a woman and young mother. Irrespective of what percentage of the electorate say that they would not be inclined to vote for a clergyperson for president, I think that the right candidate of that background could change some minds. So, Land may be right about why Huck didn't become Mac's vice presidential running mate. But don't be surprised if a clergyperson does end up on a national ticket in the near future. If that happens, it's far likelier that the candidate will be a Democrat than a Republican. A Christian clergyperson with the right combination of social sensibilities and policy positions could very well break the Red/Blue logjam that's harmed the country for so long and forge a new working majority for her or his party. As if it hasn’t lasted long enough already, we now have about nine weeks left in the US presidential election. Throughout this period, the candidates of both parties will tell us a lot of things, much of it things we want to hear designed to win us over. Today’s Gospel lesson shows us that Jesus never took the advice of political “handlers.” Otherwise, He wouldn’t have said any of what He says to us today. Let’s set the scene. Our lesson is a continuation of an incident that made up last Sunday’s Gospel lesson. 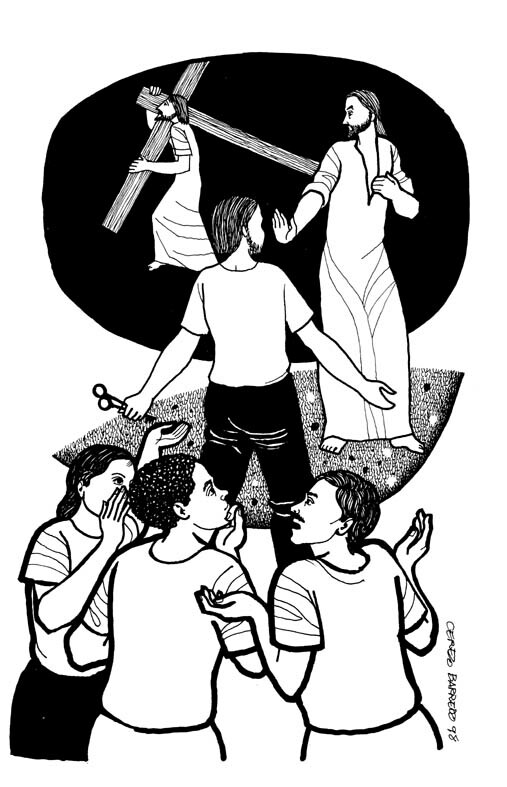 In it, Jesus applauds the confession of one of his disciples. The man whose parents named him Simon confessed that Jesus was the Messiah, the Savior King for whom the Jews had been waiting for centuries. Jesus applauded the disciple’s confession, noting that the man had reached this conclusion about Jesus not through intellectual analysis or his emotions, but as a result of that truth being revealed by God to Simon’s open mind. And then, Jesus gave Simon a new name: Peter, a word meaning rock. On the rock of Simon’s confession, Jesus would build his church. Not even death would destroy His Church, Jesus says. This isn’t what Simon the Rock of faith or the other disciples had in mind at all. And it isn’t the sort of thing designed to win people over. Nobody wants a Savor King, a Christ, Who suffers and dies, even if death is followed by resurrection. Whether from love and loyalty for Jesus, or from fear that his dreams for peace and prosperity are being threatened, or from a combination of both fears, Peter's reaction to Jesus is immediate and forceful. What exactly did Jesus have in mind when He told us to take up our crosses and follow Him? Father Andrew Greeley tells the fictional story of a family packing up to return home after a long summer vacation. The family’s oldest child is to be a senior in high school and the parents are dreading going back. They wish somehow they could freeze time and have their lives remain as they are. They feel so in control and so happy. But the high school senior finally talks sense to his parents. “We have to move on. We can’t live in the past without taking away the present and the future.” Wise words! The cross that Jesus was calling Simon Peter and the other disciples to bear represented their very human dreams of comfort and ease, of vindication and revenge, of prosperity and power. They were the dreams that we all entertain. Understandably, Peter and the overwhelming majority of those in first-century Judea held onto stubborn dreams that their country would be freed of the Romans when the Messiah came and that the Messiah would bring them endless prosperity. They would be control. That’s really what all of we earth-bound thinkers want when we’re completely honest. The real problem of Simon and his people, is our sin. That's our real problem too, our inborn alienation from God that causes us to turn away from God and that gives rise to all the stupid, tragic, horrible things we do to ourselves and to each other. Taking up the cross means renouncing short-term gain in favor of living under the reign of the God we know in Jesus Christ. The way of the cross isn’t the path we would choose if we were looking for self-preservation as the world sees self-preservation. But it’s the only way to the future that God wants to give to us, to eternity with God. I’m terrified of water. It’s irrational, but because of my fear, I’ve never learned to swim. That’s why I could identify with the person I read about who was learning to swim. * He wanted to keep his foot on the bottom of the pool. But the instructor pointed out that there are no half measures in learning to swim. “If you keep yourself anchored there, you’ll never get the hang of it,” he said. In just the same way, if you and I are going to get the new life that Jesus wants to give us, we have to let go of the old life that’s pulling us down. This call of Jesus to take up our cross and follow Him causes people to do strange things. A couple I once knew joined a congregation that was struggling and had little to offer their family. Why had they done that when there were larger congregations with lots of programs and plenty of money just down the street? “Because,” the woman said, “we were looking for a place where we could serve. This congregation needed us more.” It was a strange thing to do, but that couple took up their cross to follow Jesus. The pastor of a wealthy suburban church once shocked us by taking a call to a congregation that was in an impoverished area. “Why did you do that?” a colleague had asked. “Well,” he said, “this was the last place on earth we would have chosen to go. We figured that when God called us here, it was where we were supposed to be.” That pastor and his family bore the cross and followed Jesus. A man had been a quiet drunk for years. Although he made it to work each day and even rose within his company, his addiction to alcohol had frozen him emotionally and spiritually. At home, he had few real connections with his family. He drank because he couldn’t or didn’t want to deal with the messiness of life. He walled himself off beneath a veneer of booze and false optimism. It was too painful to him. One day though, he confided to a doctor friend that he had a problem. From then, he began a detox program and started the painful work of rebuilding his life. Why had he done that? He could have gone on and nobody would have been the wiser. He did it, he said, because he’d come to believe that exposing himself to the realities of life sober was better than anesthetizing himself from them with drink. He bore his cross. He committed himself to living life, to loving God and neighbor, no matter what pain and difficulty it might bring. The old self began to die so the new self, the self turned to God, could live. And what about you? Are you protecting yourself from life, looking out for number one and so denying yourself the life with God that belongs to those who follow Jesus Christ? It’s a life filled with challenges, to be sure. It’s not an easy way. But it is the way to eternity, the way to peace with God and peace with ourselves. The only way. I pray that you—and I—will let God give us the faith and the courage to follow Jesus and so become the people and the church God calls us to be. *This represents my own slight reworking of an illustration used by N.T. Wright in explaining this passage of the Bible. **In the coming weeks of this campaign, you and I may face many such calls to carry the cross and follow Jesus when we're subjected to other bigoted jokes about senior citizens directed at John McCain and women directed at Sarah Palin. Those bigoted jokes will also be expressions of sin and as Christians, we can't allow ourselves to be party to them! ABOUT THE ILLUSTRATION: I love the pen and ink representation of this passage created by Cerezo Barredo. Notice that Peter holds keys in his hands. Peter, the stand-in for the Church, holds the keys to the kingdom which Jesus entrusts to the Church: the power to declare or withhold the forgiveness of God, to repentant or unrepentant sinners, respectively. This is a great way of conveying the truth that the Church, composed of finite, sinful human beings, is both divine and human. Similarly, individual Christians are saints and sinners.